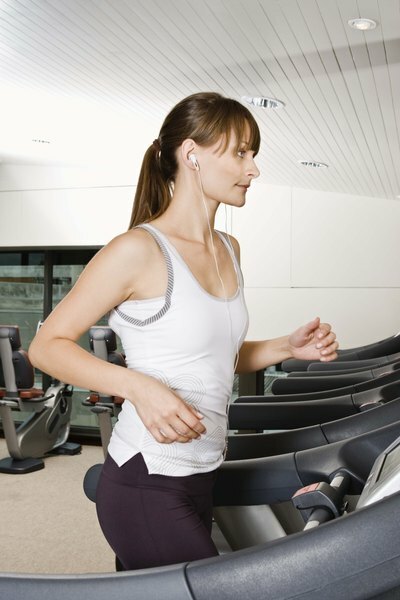 Running on a treadmill is a better alternative for burning calories. Over two-thirds of Americans over the age of 20 are either overweight or obese, according to the federal Centers for Disease Control and Prevention, or CDC. Exercise can be a useful way to lose some of the extra weight, but unfortunately, many people turn to fitness gadgets that are ineffective for burning fat. Advertisements for the Ab Lounge showcase models who appear to use the product and develop impressive six-pack abs. What the ads don’t tell you is that if you are overweight, you cannot lose enough weight with the device to ever showcase your ab muscles. The treadmill, on the other hand, has been proven as an effective machine for helping you to lose weight. The Ab Lounge is an abdominal exercise machine sold in infomercials, the Internet and various department stores since 2003. 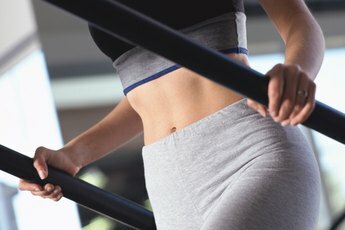 It promises to give you “the abs you always dreamed of.” While the machine may be useful in strengthening your ab muscles, abdominal exercises, whether they are performed on a machine or not, are not effective for burning weight. A person weighing 160 pounds will burn only 326 calories doing crunches at a moderate pace. This is only 12 more calories than walking at a pace of 3.5 miles per hour. The manual for the Ab Lounge also recommends additional, regular cardio and weight training to burn calories. Unlike the Ab Lounge, the treadmill has been scientifically proven to help exercisers lose weight. The Mayo Clinic estimates that a 160-pound person running at a moderate 5 miles per hour burns an average of 606 calories. That’s almost double the amount of calories burned doing crunches. A study published in the May 1996 issue of the Journal of the American Medical Association, or JAMA, also found that running on a treadmill burns more calories than exercising on any other gym machine when participants work at the same levels of perceived exertion. Exercise is beneficial for losing weight, but cutting calories through diet is more effective than physical activity, according to the Mayo Clinic. Small dietary changes can add up to hundreds of calories with very little sacrifice. Burning a similar amount of calories could take a considerable amount of time daily. A successful weight-loss program is well-rounded, consisting of both exercise and a proper diet to burn a sufficient amount of calories to lose weight. While many people want to lose the weight as quickly as possible, slower weight loss is more sustainable. The CDC recommends losing an average of 1 to 2 pounds a week and notes that people who lose weight at this slower rate are more successful at keeping the pounds off. Aim to lose approximately 500 calories per day through diet and exercise to lose 1 pound (equal to 3,500 calories) per week. Journal of the American Medical Association: Energy Expenditure with Indoor Exercise Machines; Anne I. Zeni, et al. Mayo Clinic: Which is Better for Weight Loss – Cutting Calories or Increasing Exercise? Are Treadmills a Good Way to Lose Visceral Fat?